It seems clothing stores have all but forgotten about clothing for big and/or tall guys. It’s frustrating when you can’t find something that fits, which is why we’ve outlined the difference in shopping at a store that regularly fits men with unusual sizes. If you visit the men’s section in a typical big box clothing store, you’ll find, more often than not, waist sizes stop at 32 and the largest shirt size is XL. It seems clothing stores have all but forgotten about clothing for big and/or tall guys. It’s frustrating when you can’t find something that fits. Really frustrating. You see a shirt at a store you like and try it on only to find it won’t button, is too short or you can barely breathe in it. Perhaps you do find a shirt that finally fits - only to have it go through one wash cycle and shrink. Unfortunately, this is all too common. Where those typical big box clothing store sizes end is where Hensley’s Big & Tall sizing excels. A visit to Hensley’s Big & Tall ensures you’ll get measured for your size by our team of experts so your clothes will fit great and won’t go small in the wash.
How can we be so sure that your clothes won’t go small in the wash after a purchase from Hensley’s Big & Tall? We don’t buy brands that have shorter cuts of fabric in any area. Because well-known brands aren’t always accessible in big and tall sizes in department stores, men think they have to sacrifice fit for quality - it’s not true. We buy brand name clothes from quality retailers and turn away the chintzy low-level products without hesitation. If you buy it here, believe it will last. With over 40 brands, you’ll be able to find clothes from brands you know and trust that are synonymous with quality. When you walk through the door, Hensley’s team of experts already know what brand will fit you best. They make sure you buy clothes that fit correctly by measuring your neck, arms, and waist. At Hensley’s you’ll find quality clothing that looks and feels great. When people think of big and tall clothing, they have the misconception that you have to be a mythical giant to ever step foot in a big and tall clothing store. Not true. The name inherently promotes the misunderstanding, big AND tall. The fact is, many guys who shop at a big and tall store aren’t both. Think of an athlete for example. Some are very tall and thin and others are average height but very muscular in the shoulders and thighs. Either person is a big and tall customer even though they don’t fit most people’s stereotype. What we’re saying is, don’t let the phrase big and tall turn you off - the average Hensley’s Big & Tall customer is about 6 foot tall and weighs around 200 lbs. not 400 lbs. like you’d imagine. Customers come in all shapes and sizes; you don’t have to be both big and tall to visit Hensley’s Big & Tall. One hundred different guys could walk through the door and have all different measurements when it comes to height, weight, arm length, shoulder length, torso length, waist, etc. We have customers that are 5 foot 8 inches with broad shoulders, long torsos and long arms with smaller waists, to intense athletes with large muscles. Hensley offers a wide array of sizes to fit you and your body type. If for some reason your size is not in stock, we can order it, or our tailoring experts can alter the clothing to give you the perfect fit. How Do I Know That I Need To Shop at a Big and Tall Store? Unsure if you need to buy clothes in “big” sizes at a big and tall store? If you’re 6'2" or shorter and your waist measures the same or larger than your chest, you need clothes from a big and tall store. 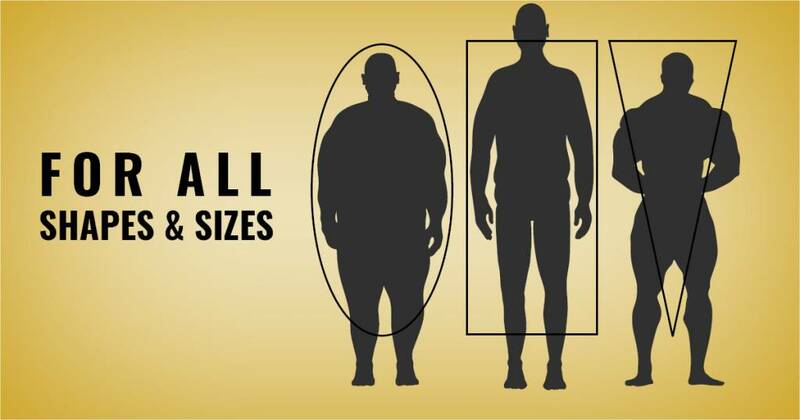 “Big” sizes are designed for men with a full waist and average height. Unsure if you need to buy clothes in “tall” sizes at a big and tall store? If you are 6'2" or taller and your waist measures less than your chest, you need to shop for a “tall” size from a big and tall store. Tall sizes are made to be two inches longer in length than a regular-size, and the sleeves will be one inch longer. Hensley’s also carries extra tall men’s clothing for those who need even more length..
Are you still unsure about big and tall sizes? If you’re on the fence, it’s because you can’t find the clothes you need at a typical clothing retailer, but will do anything to avoid a big and tall store. Stop torturing yourself and take the leap! We promise you’ll either find what you need, or walk out knowing what size you need to shop for . When you visit Hensley’s, our team of experts take your measurements and tell you definitively what sizing is best for you. Extra in the sizing means just that - they’ve added extra fabric. Beware; the extra fabric isn’t likely to be the place where you need it for your body type. A guy with long arms can’t just throw on an XXL and expect the rest of the shirt to fit. Big sizing does a better job of designating where the extra fabric went. In a big size, you’re going to get more width, but it’s not always clear where. If your clothes are too tight in the midriff and shoulders, you will be better off with a big size. Similar to big sizing, tall sizing tells us the extra fabric went to making the clothes longer. The shirt or pants will be longer everywhere though, so these sizes aren’t always ideal for people who have long arms, but average-sized torso, for example. If you fall into the category of both big and tall, we carry sizes for you that will have extra room in the body as well as extra length in both the sleeves and torso. Hensley’s carries a large number of sizes, you can be sure you’ll find a variety of big and tall shirts, pants, vests, golf shirts, polos, shorts, swim trunks and more that will fit you. What is considered big and tall? It’s difficult to define, but we can give you some scenarios to help you decided if you’re outside of the normal size range. Generally, if you’ve ever had frustrations with big box retailers not having sizes that fit your broad shoulders, long legs, long torso, or large waist, Hensley’s is the place for you. Off-the-rack shirts are made to fit the general population, the average guy. If you’ve ever been described as having broad shoulders, or a “barrel chest”, you’re not the average guy. The best you can do is buy a size that accommodates your larger shoulders and chest, but is way too big for your mid section. This leads to the dreaded “muffin top” when you tuck your shirt in, or worse, the shirt isn’t even long enough to tuck in. You deserve a shirt made for your specific build, a big and tall shirt that gives you room to move and doesn’t look like you’re wearing a parachute. If you’re a tall guy, we understand the frustration you experience at a typical retailer. Not only are the sales people uninformed and generally apathetic about your needs, you find pants that are always too short and look like women’s capris. Adding to the frustration, there are no shirts for tall guys, or men with long a long torso. Sure, you can find a nice shirt that fits your shoulders but then you realize your belly button is uncovered for the world to see. Not good. Rest assured, Hensley’s has clothing for tall guys and guys who aren’t evenly proportioned. We have all the sizes you need for your pants, jeans, casual shorts, swimming trunks and more. We see athletes in our store all the time and it’s because retailers simply don’t have pant sizes to accommodate men with muscular thighs or large calves. The biggest complaint from athletes trying to shop for business casual wear or suits is their inability to find pants that aren’t too tight. No one their pants to get caught on their calves, nor do they want to look inappropriate because their pants are too tight around the thigh, despite fitting perfect at the waist. We can point you to sizes and brands that won’t suffocate your legs, and you’ll walk confidently knowing they look great. Why Does It Matter That My Clothes Fit? Your clothes are about so much more than just covering your body. What you wear affects how you feel and how you act. We challenge you to test us on this. Walk in to Hensley’s wearing your typical, everyday, frustrating clothes. Then, let us replace your clothes with the items and brands we recommend. Not only will you notice the difference in fit, your confidence and self image will increase drastically. How much better would you feel walking into your next meeting, date, or networking event knowing your shirt and pants fit perfectly? Don’t take our word for it, let us prove it to you. Sizes vary from brand to brand, an extra tall shirt versus a regular shirt for someone that is tall can make a world a difference when it comes to fit. The extra length in the sleeves with the extra fabric means that it will hit your wrist bone and that the shirt will fully cover your torso. If that sounds like what you need, an extra tall men’s clothing section at Hensley’s will be perfect for you. We live in a world of tapered, fitted shirts where retailers have forgotten about clothing for big and tall guys. Coming to Hensley’s, you don’t have to sacrifice fashion. We have brands you know and love. With great brands like Levi’s, Tommy Bahama, Lucky Brand Jeans, and Luschiano Visconti you can be fashionable. We carry many brands that fit your style taste as well as your body. We’re a place with sharp brands that you’ll be sure to get compliments on. Hensley’s doesn’t just have dress shirts, there are over 40 different brands carried that cover business casual, jeans, vests, golf shirts, outerwear, sportswear, swimwear, and more. Why Go To Hensley’s Big & Tall? Hensley’s Big & Tall has a team of experts that make the retail experience personal and will take the time to measure your size and ensure you find the right fit for your body. With over 65 different brands of dress shirts and streetwear, you can be sure Hensley’s Big & Tall has what you’re looking for. There are also 5 different styles of T-shirts along with 25 different pant fits. Clothing ranges from business casual wear, jeans, vests, outerwear, sportswear, shorts, swimwear, and more. How Should Clothes Fit Me? A T-shirt should be slim-fitting without showing off too much with the sleeves right above you biceps. The hem at the bottom of the shirt should be around your belt loop line, the collar shouldn’t be suffocating and the shirt hole for your head shouldn’t be so large you’re showing off your back. Dress shirts should fit with the collar lightly pressing against the skin with the buttons buttoning comfortably. The sleeves should allow you enough room to move freely and the sleeve cuffs should hit your wrist bone with your arms out in front of you like a zombie. When untucked, the shirt should go just past your belt line. How Should Your Pants Fit? Pants should fit the same way you try them on in the store: without a belt. The pants should comfortably sit on your hips and you should be able to move around without any strain or resistance. Many men with broad shoulders are used to not having enough fabric when putting their arms into the arm holes. Our shirts for men with broad shoulders have that extra fabric you need right where you need it. The Hensley’s Big & Tall brand shirt has the biggest arm hole and will fit you great. No more short sleeves that don’t make it all the way to your wrist or short-torso shirts that can’t make it to your belt line. We carry brands like Enro, these shirts for skinny guys with long arms have extended sleeves and are longer in the torso, providing a perfect fit just for you. At Hensley’s Big and Tall we have the right sizes for guys that have a bigger waist. Our Cutter and Buck shirts give you the extra fabric you need around the belly area to fit you great. Our team of experts at Hensley’s Big & Tall aims to provide an unmatched retail experience. When you’re here, not only will you will find modern, stylish clothes that actually fit you, we will leverage our expertise to make it easy for you. Stop by today to see what you’ve been missing!